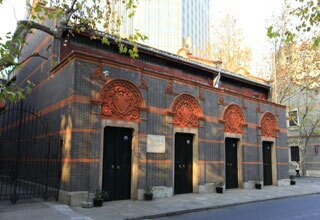 Jade Buddha Monastery, one of the most famous Buddha religious temples, is situated in Shanghai, which is a modern, bustling city in China. It attracts many visitors locally and overseas to Shanghai every year, especially during the Chinese New Year.There are a lot of religious events hosted by the temple. The temple can pursue silent from sound, and is described as a clean land in the busy city. The main and popular structures of the temple are the great Devajara Hall, Mahavira Hall, the Jade Buddha Tower; others are the Kwan-yin Hall, Amitabh Hall, Tang Hall, Dining- Room, also Recumbent Buddha Hall. The temple was initially built in 1882 and named for the two jade Buddhist statues. The smaller one was imported to China from Burma in l882 by Monk Huigen, the bigger one was brought from Singapore by Zhenshan, in 1890. The story is that a Buddha from Putuoshan moved to Myanmar via Tibet, dragged the Buddhist back to its current place and then went off in search of charities to construct a temple for it. The sparkling and crystal-clear white jade gives the Buddhist statues the beauty and sanctity. At the temple, there are many other priceless masterpieces – such as paintings and Buddhist scriptures throughout the different halls. The shrine’s remarkable porcelain collections of sitting well-imprinted, carved Buddha statues make the temple venerable and attractive. The Jade Buddha Temple is not famed for its architecture, which is very new and built in a standard Song Dynasty style. The two Buddha’s housed within, both made of white jade in Burma depict Shakyamuni Buddha (the historical Buddha). The more impressive of the two is the seated Buddha, 2 meters (6 feet 5 inches) tall, weighing 205 kg (452 lb.) and decorated with semi-precious stones. 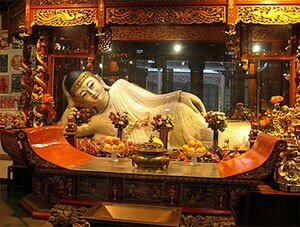 The other statue is a serene and beautiful Reclining Buddha about 1 meter (3 feet 4 inches) long. 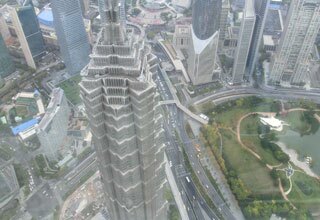 Transportation: just take the metro available to the Shanghai train station and then walk around 1 km.Also tunnel Line 6 at Wulian Road, leave on the Shiji Dadao and then take Underpass Line # 2 and get off near at Nanjing Road West; Bus 13, 19, 24, 36, 54, 63, 68, 76, 105, 106, 112, 113, 138, 206, 223, 506, 516, 550, 563, 738, 768, 830, 837, 866, 922 will also take you there. Open Time: 8:10am to 4:30pm, everyday; Events hosted during religious holidays: New Year&apos;s Lunar Day, fifteenth day of the first lunar month. At that moment, the temple will have certain special events. 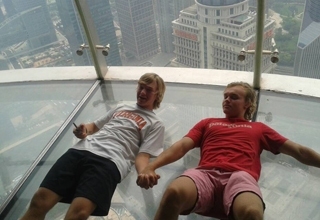 Admission Fee: 20 RMB, additional 10 RMB to the Jade Buddha’s. 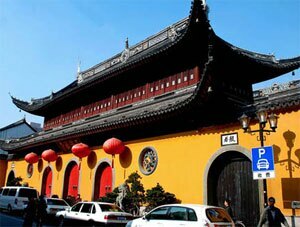 Evaluation: This is one of the most famous monasteries of Shanghai with a history of more than 100 years.